Woodturning is the craft of using the wood lathe with hand-held tools to cut a shape that is symmetrical around the axis of rotation. Like the potter's wheel, the wood lathe is a simple mechanism which can generate a variety of forms. The operator is known as a turner, and the skills needed to use the tools were traditionally known as turnery. In pre-industrial England, these skills were sufficiently difficult to be known as 'the misterie' of the turners guild. The skills to use the tools by hand, without a fixed point of contact with the wood, distinguish woodturning and the wood lathe from the machinists lathe, or metal-working lathe. Wood lathes work with either reciprocating or continuous revolution. The reciprocating lathe is powered by a bow or a spring, rotating the wood first in one direction, and then in the other. The turner cuts on just one side of the rotation, as with the pole lathe. The reciprocating lathe may be human-powered with a bow, as well as with spring mechanisms. The reciprocating lathe, while primitive technology requiring considerable dexterity to operate, is capable of excellent results in skilled hands. For example, reciprocating bow lathes are still used to turn beads for the Arabian lattice windows called Meshrebeeyeh that so charmed Holtzapffel in the 1880s . Continuous revolution of the workpiece can be human-powered with a treadle wheel, or achieved with water, steam, or electric power. The style of cutting does not have the pause required by the reciprocating lathe's rotation. Even with continuous revolution, however, the turner controls the contact of tool and wood entirely by hand. The cutters are not fixed, nor advanced automatically, as with the metal-working lathe. The nature of wood defines woodturning techniques. The orientation of the wood grain, relative to the axis of the lathe, affects the tools and techniques used by the woodturner. In spindle turning, the grain runs lengthwise along the lathe bed, as if a log were mounted in the lathe. Grain is thus always perpendicular to the direction of rotation under the tool. In bowl turning, the grain runs at right angles to the axis, as if a plank were mounted across the chuck. When a bowl blank rotates, the angle that the grain makes with the cutting tool continually changes between the easy cuts to two places per rotation where the tool is cutting across the grain and even upwards across it. This varying grain angle limits some of the tools that may be used and requires additional skill from the turner. Moisture content affects both the ease of cutting wood and the final shape of the work when it dries. Wetter wood cuts easily with a continuous ribbon of shavings that are relatively dust-free. However, the wet wood moves as it dries. shrinking less along the grain. These variable changes may add the illusion of an oval bowl, or draw attention to features of the wood. Dry wood is necessary for turnings that require precision, as in the fit of a lid to a box, or in forms where pieces are glued together. The character of the wood creates other challenges for the woodturner. Turners of hardwoods and ivory select different tools than those used for cutting softwoods. Voids in the wood require higher lathe speeds, fillers, or extra safety precautions. Although other woodworkers value tight, straight grain, woodturners often search out the unusual wood from roots, defects, or diseased portions of trees. The craft of woodturning is preserved and advanced by a community of practitioners. Until the 1970s, an apprentice system in the U.K., and Industrial Arts education in the U.S., preserved many of the traditional skills of the craft. Between 1975 and 1985, industrial arts teachers, hobbyists, artists, collectors, and tool suppliers developed the symposium format for exchange of information about the craft. This community was a kind of prototype for the artisan-based maker culture active in the 21st century. The community organizes regional, national, and international symposiums, publishes journals, and hosts travelling experts at club events. Most publications and DVDs are of the DIY variety, including numerous YouTube videos. The "Robert Chalker Mazer", Britain 1480-1500, Victoria and Albert Museum. Maplewood with silver-gilt rim and boss. The boss is engraved with the Trinity, originally enamelled, an unidentified merchant's mark and the inscription ROBERT CHALKER IESUS. The archaeological record of woodturning is limited to illustrations because wood is a fiber prone to rot. Egyptian monuments illustrate a strap used by a helper to rotate the lathe while another worker cut the wood. Early bow lathes and strap lathes were developed and used in Egypt and Rome. The Chinese, Persians, and Arabs had their own variations of the bow lathe. Early lathe workers would sometimes use their bare feet to hold cutting tools in place while using their hand to power the lathe. Bow lathes continue in use right up to the present day, and much of our information about them comes from watching turners use them. Between 500 and 1500 A.D., turned wooden vessels served as the everyday bowls and cups of most of the population of Europe. Our knowledge of these humble vessels comes from bowls excavated from shipwrecks, such as the Mary Rose and the Oseberg burial ship, or dug out of deep wells, where they were preserved in a nonaerobic environment. Much of this ware was turned from green wood on a spring pole lathe. Finely crafted drinking bowls, known as mazers, were produced in very limited quantities from dry wood, then decorated with silver-gilt central bosses and rims. As early as 1568, a separate fly wheel powered a lathe via a drive belt. A master would cut the wood while an apprentice turned the crank on a huge wheel, often several feet in diameter. This was a continuous revolution lathe, which led to adaptation to external power sources such as water, steam, and electricity. This lathe evolved into the 'queen of machine tools' which made it possible to turn parts for other machinery. The Holtzapffels developed ornamental turning lathes from the continuous revolution lathe combined with metal-working innovations like the automatic slide rest. These lathes worked from geared patterns to cut designs in hardwoods such as ebony. They were favored as a hobby by European princes, meriting a mention by Tolstoy in War and Peace (1869). Woodturners in London organized into a guild as early as 1310 on Wood Street. By 1347, the Turners Company was assigned responsibility for regulating weights and measures by the Mayor. By 1591, they built their own Hall. The Company governed the apprentice system, and established pricing for goods. In 1604, they were incorporated as the Worshipful Company of Turners of London. Outside of London, the craft was decentralized and unregulated. Itinerant turners known as Bodgers set up temporary pole lathes near the source of wood for turning furniture parts. In the 19th and early 20th century, woodturners in England worked in Turning Shops, usually within the master-apprentice system. In Germany and Russia, woodturning was concentrated in villages which had a specialty, such as turning toys. Bow lathes and pole lathes continued in use for decentralized, one-man production of architectural elements and bowls in many parts of the world. In the US, woodturning was part of the curriculum of industrial arts taught in public schools—often a prerequisite for classes in building furniture. The 'problems' from textbooks included both tool management skills, and assignments to turn objects such as gavels, darning eggs, boxes, trays, candlesticks, lamps, and legs for furniture. Woodturning skills were used by patternmakers in the making of prototypes and shapes for casting molds used in foundries during the 19th and 20th century. They worked very slowly to achieve precision, using enormous patternmaker lathes and slow-cutting scraping tools. Woodturning has always had a strong hobbyist presence. In the 1970s, an explosion of interest in hobby woodturning in the English-speaking world sparked a revival in the craft. Dr. Dale Nish travelled to England to recruit teachers, tools, and techniques from the last of the apprentice-trained woodturners. A few years later, Canadian Stephen Hogbin spent a year in Australia, pushing the limits of the craft through changes in scale and design. Industrial arts teachers used their institutional affiliation to create seminars, publish books, and foster research. The tool industry identified a new market for lathes and turning tools. A small group of serious collectors invested in the increasingly sculptural explorations of woodturners. It is unusual that woodturning never established a strong foothold in university departments of art and design. Instead, practitioners of the craft have become adept at learning from demonstrations, private classes, regional meetings, their own published journals, and internet technologies. Some artists began as woodturners, and moved into more sculptural work, experimenting with super object forms and other fine craft concepts. The Center for Art in Wood, founded in 1986 as The Wood Turning Center, houses a collection in Philadelphia with over 1,000 objects from international artists  as well as a research library and gallery. Other turners have chosen an artisan-based focus on traditional work, custom work, and the pleasure of studio practice. Complex forms made on a wood lathe develop from surprisingly few types of cuts: parting, planing, bead, cove, and hollowing. Parting separates the wood from the holding device, or establishes depth cuts. Planing is done with a tool in which the bevel below the cutting edge supports wood fibers, just as in a typical wood planer. Beads are a convex shape relative to the cylinder, and coves are a concave shape. Hollowing techniques are a combination of drilling and scooping out materials. The woodturner is at liberty to choose from a variety of tools for all of these techniques, and the quality of the cuts improves with practice wielding the tool selected. Turners rely upon three points of contact making any type of cut: the tool presses down on the tool rest, and against the woodturner's body before contacting the surface of the wood, most often with a bevel edge riding the surface of the wood. The objective is to position the tool correctly so that the wood comes around to the cutting edge, generating a thin shaving without chipping or tearing out sections of the wood. Woodturners prefer to use very clean cuts to minimize the time spent with abrasives. When it is necessary to sand the piece, they do so on the lathe, using abrasives held by hand, in an inertial sander which revolves with the wood's own rotation, or with power tools—drills or right-angle drills. The lathe also becomes a useful holding device for carving, burning, texturing, coloring, and finishing the form. The wood rotates between the headstock of the lathe which includes the drive mechanism and the tailstock support, which only rotates if its center is 'live' or supported by a rotating holding device. The headstock end may use points or spurs which are driven into the wood. This type of turning is described as 'between centers.' The headstock spindle may also use a cup, collet, or a scroll chuck to hold a tenon on the workpiece which will be removed in the finished product. The wood can also be screwed or glued to a faceplate—a strong disk that is threaded to mount on the headstock's spindle. The use of a chuck or faceplate allows the woodturner to forego tailstock support for the rotating wood. This type of secure holding system is essential for hollowing bowls or hollow forms. Woodturning tools must be sharpened more frequently than other edged woodworking tools to maintain a clean cut because the wood passes at great speed. Sharpening is usually accomplished with the aid of mechanical devices such as powered sharpening wheels and abrasives. This sharpening process requires either skill of the craftsman, or one of the many available sharpening jigs, which facilitate maintaining a specific bevel on the tool. As with any mechanical sharpening method, overheating or blueing is a danger to be avoided as it will ruin the steel's temper, rendering the steel too soft to maintain a sharp edge. When this happens, the blued area must then be ground away to expose fresh steel and the tool must then have the bevel reestablished and the edge re-honed. High speed steel is not prone to blueing (overheating) whereas carbon steel blues easily, requiring frequent quenching in water or oil to avoid losing temper. bowl gouge - a deep fluted gouge used to turn the outside and inside of bowls and vessels. Often has a thicker shaft and longer handle than a spindle gouge because it has to cut farther away from the tool rest and deal with the forces of turning a large bowl. Sometimes called 'long and strong' gouge. Sculptureturnery – turning on a lathe that will generate turned work that is not necessarily circular, can be any of the following cross –sections; elliptical, triangular, square, pentangle, hexagonal, heptangular. Multi-dimensional wood turning - requires that the work piece as it rotates will be able to move cyclically along the lathe bed and/or simultaneously move cyclically across the bed. Three dimensional woodturning – is where the shape produced by the lathe is not symmetrical about the axis of rotation. Ornamental turning - also known as OT, a method in which the piece is mounted upon a rocking headstock, and a spinning tool is used to cut out exotic and decorative patterns. The device is called a rose engine lathe. Twistwork - A type of carving on spindles or vessels, in which the lathe is a holding device and the turner makes spiral cuts. The turner may use a grid drawn on the wood, or cut entirely by eye, using either hand tools, power tools, or abrasives. Ear protection - Compared to other power tools, a lathe is a quiet machine. Ear protection should be used if noise is excessive, this may be due to motor (fan) noise from a shop dust collector, or the combination of wood and tool being used. Hand/skin protection - Gloves should not be used with rotating equipment, since there's always a risk of getting tangled in the machine. Nevertheless, some woods provide splinters that not only puncture skin, but also cause festering sores and/or skin irritation. Polishes and finishes used in woodturning can also be harmful or irritant to skin, often containing organic solvents such as methanol, turpentine and toluene. This subject continues to be debated in the community. Foot protection - Protective footwear, often leather steel-toe boots, is required for any type of shop activity. S - Speed - check the rpm speed, slower for big, heavy things, faster for smaller lighter things. Most authors recommend always starting at slow speeds and re-setting speed to low at end of session. R - Revolve - Check that the wood can turn around without encountering any obstructions, such as the tool rest, by rotating it by hand. Safe usage of a lathe also depends on the operator's choice of proper techniques for the lathe, tools, and wood. For example, using a high spindle speed with an unbalanced wooden blank may cause the lathe to vibrate dangerously. Spinning a large turning blank too fast may cause it to explode. 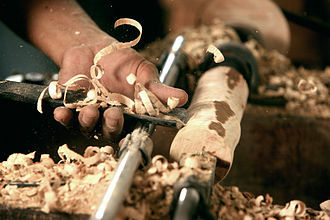 Inappropriate use of tools such as gouges and skew chisels can cause a catch, where the tool bites suddenly and aggressively into the wood in an uncontrolled manner. This exerts very large forces on the wood, the tool, the lathe and the operator, often causing the wood to break apart or tear free from the lathe. Lathe accidents often pull the tool out of the operator's hand and throw them in unexpected directions. Particular care is also required for wooden shapes that are not circular, such as off-center work, or bowls with wings or square rims. Portions of the turning extend farther from the axis of rotation, and are sometimes more difficult to see than the bulk of the wooden blank. Kijiya - The woodturner in Japan. ^ Holtzapffel 1976, p. 10. ^ Shaw (2016), p. inside cover-first page. ^ Wood (2005), p. 11-12. ^ Holtzapffel (1975), p. 5. ^ Wood (2005), p. 13. ^ Wood (2005), p. 59-98. ^ Wood (2005), p. 99-110. ^ Hotlzapffel (1976), p. 30. ^ Woodbury 1963, p. 132-140. ^ Wood (2005), p. 9. ^ Wood (2005), p. 88. ^ Ritchey, 1942 & p.41-42. ^ Cooke, Jr., Edward S. (2001). Wood Turning in North America Since 1930. The Wood Turning Center and Yale University Art Gallery. pp. 15–17. ISBN 0-89467-094-8. ^ "A collection of Goblets and Chalices from the Seventeen Peoples of the Eight Inner Worlds - The Center for Art in Wood". centerforartinwood.org. ^ "About - The Center for Art in Wood". centerforartinwood.org. ^ Child (1997), p. 28. Holtzapffel, John Jacob (1976). Hand or Simple Turning (reprint of 1881 London series ed.). New York: Dover. ISBN 0-486-26428-9. Crawshaw, Fred (1911). Problems in Woodturning (1909 first edition as a textbook ed.). Peoria: Manual Arts Press. Stanley-Stone, A.C. (1925). The Worshipful Company of Turners of London (drawn from records of the Company ed.). London: Lindley-Jones and Brother. Ensinger, Earl W. (1943). Problems in Artistic Woodturning (c. 1926 as texbook ed.). Milwaukee: Bruce Publishing Co.
Pinto, Edward H. (1969). Treen and Other Wooden Bygones (first published in 1949 ed.). G. Bell & Sons. Child, Peter (1997). The Craftsman Woodturner (first published 1971 ed.). London: Guild of Master Craftsmen Publications LTD. ISBN 1-86108-075-1. Nish, Dale L. (1975). Creative Woodturning. Provo: Brigham Young University Press. ISBN 0-8425-1557-7. Nish, Dale L. (1980). Artistic Woodturning. Provo: Brigham Young University Press. ISBN 0-8425-1842-8. Hogbin, Stephen (1980). Woodturning: The Purpose of the Object. New York: Van Nostrand Reinhold Company. ISBN 0-442-25775-9. Jacobson, Edward (1985). The Art of Turned-Wood Bowls. New York: E.P. Dutton, Inc. ISBN 0-525-48165-6. Jones, Bill (1996). Notes from the Turning Shop. Lewes: Guild of Master Craftsmen Publications Ltd. ISBN 1-86108-017-4. Jones, Bill (1997). Further Notes from the Turning Shop. Lewes: Guild of Master Craftsmen Publication Ltd. ISBN 1-86108-036-0. Wood, Robin (2005). The Wooden Bowl. Ammanford: Stobart Davies Ltd. ISBN 0-85442-130-0. Shaw, Tib; Martin, Terry; Kelsey, John (2016). "Woodturning's Long Journey (timeline)". American Woodturner. 31 (3): inside front cover and page 1. Woodbury, R.S. (1963). "The Origins of the Lathe". Scientific American. 208 (4): 132–140. Ritchey, James; Monroe, Walter W.; Beese, Charles; Hall, Philip (1942). Pattern Making. Chicago: American Technical Society. Wikimedia Commons has media related to Woodturning. This page was last edited on 18 February 2019, at 01:47 (UTC).